We left Wanaka on Friday morning heading for Te Anau on the edge of the Fiordland National Park, the journey took us over the Crown Range of mountains and this time the road conformed to expectations. We drove through the valley and then up over the range, we emerged from the pass at 1080m and stopped to look at the countryside laid out below us. The road then wound down steeply and led us to Queenstown, we didn’t stop, we will be back here later in the week and will have time to look around then. 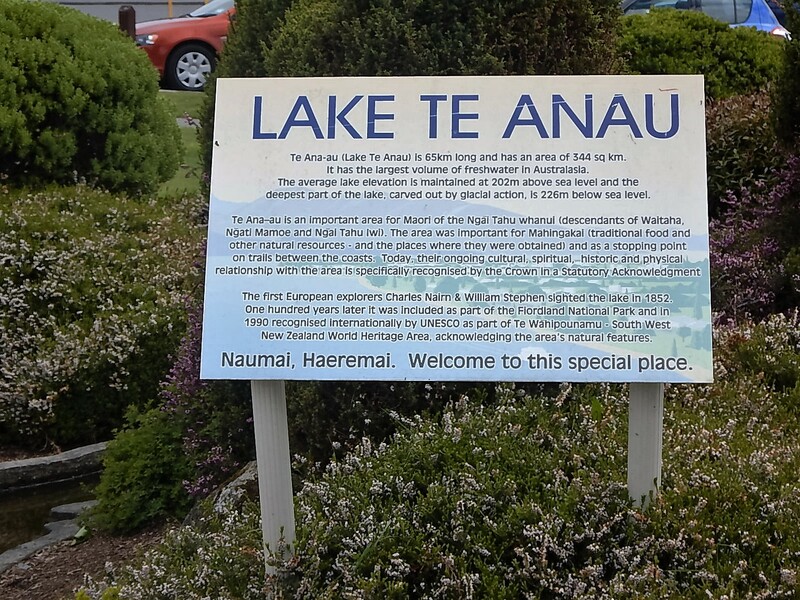 We carried on heading south and then turned west and eventually reached Te Anau another little lakeside town. Lake Te Anau is huge, it isn’t the biggest lake in NZ by surface area but it is very deep so it is the largest body of water in NZ, the shoreline is 500km around! We arrived in mid-afternoon and decided to stop in town before checking in to our next B&B. 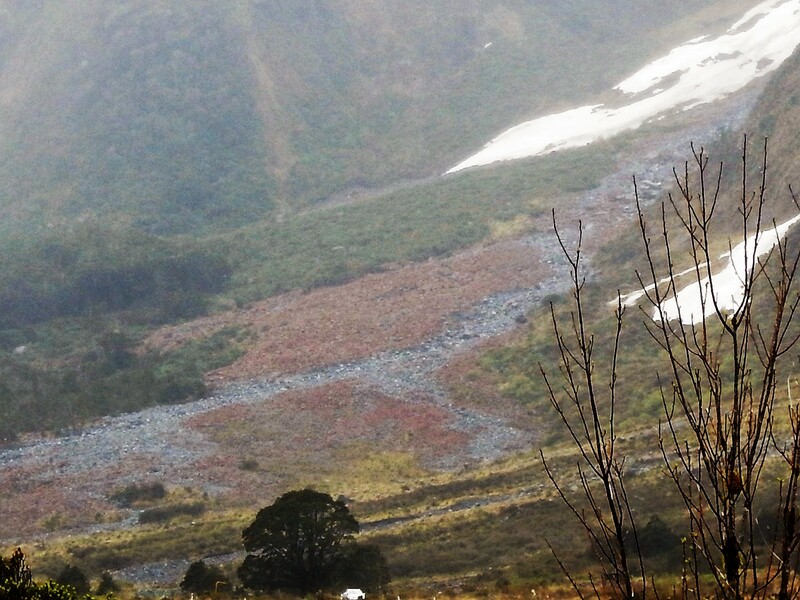 We had read about a film that is shown hourly in the Te Anau cinema and which is recommended as an introduction to the Fiordland National Park, the timing worked so we took a seat to watch Ata Whenua – Shadowland. Fiordland National Park is part of a vast area of Southwest NZ that has been declared a UN World Heritage site, it is pristine wilderness and most of it has never been explored. There is just one road into Fiordland (more of that later) other than that the only way in is on foot, by kayak or by taking a scenic flight on a helicopter or a small plane. The total SW NZ World Heritage site accounts for 10% of the country’s landmass, Fiordland National Park alone is bigger than Yellowstone and Yosemite Parks in the US combined. Ata Whenua is 35 minutes of aerial photography of the Fiordland region, presented with a beautiful soundtrack but no commentary it showed the National Park throughout the seasons. The footage of snow covered mountain peaks, rivers, gorges, lakes and waterfalls was breath-taking, apparently the film crew spent years working with local helicopter pilots to capture the best views they could, and it showed. After the film we stopped to buy two award winning, homemade hot meat pies from the local bakery and walked down to the lakes edge to eat them, just in time for the rain to start! We dashed under the awning of a nearby office for shelter, the rain lasted exactly as long as the pies; from there it was time to find Dunluce B&B which we found a little bit out of town overlooking the lake and the mountains beyond. 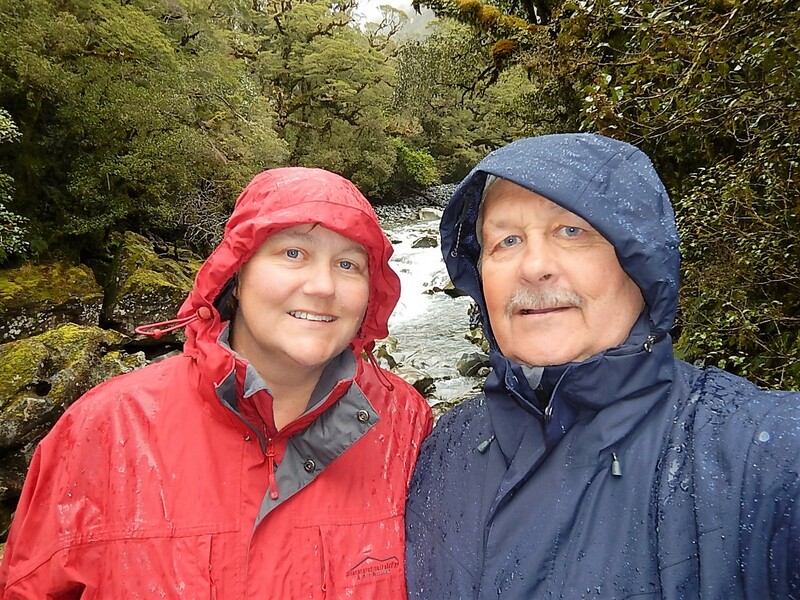 On Saturday we were booked on a boat trip on Milford Sound, one of the iconic NZ experiences and one that is featured in every brochure and travel guide. The coach picked us up at our B&B at 8am, how about that for service! It was a two-hour drive to Milford Sound along the only road inside the Fiordland National Park, it skirts the north-east boundary passing through farmland and rain forest, across high tundra valley floors and winds up into the mountains. Mark was very glad he wasn’t driving; our driver Eve did a great job stopping at several interesting places on the way and providing a commentary about the landscape and the challenges faced by the road builders. At the top of the climb we went through a long tunnel and then zig zagged down into Milford; the one-way tunnel was controlled by traffic lights and while we waited 10 minutes for the lights to change we were entertained by a pair of Kea, large alpine parrots only found in this area. The Kea are very cheeky and we watched them working their way along the line of cars checking each one for food scraps and treats. Milford itself is just a marina serving the tourist boats that cruise Milford Sound, a salt water fiord winding between vertical granite cliffs soaring over 1000m above water level. We were booked on the Milford Mariner, an historic motor sailing vessel, for a two-and-a-half-hour cruise along the sound, out into the Tasman Sea and back. Along the way we saw fabulous waterfalls (it had been raining through the night and most of the morning so they were at full force); lots of NZ Fur Seals basking on rocks and swimming in the sound; and two groups of Fiordland Crested Penguins, the second most endangered species of penguin in the world. It was a magical trip, the captain even took the boat within 10ft of two of the waterfalls, close enough that we couldn’t hear anything but the roar of the water and everybody on deck got soaked. Once ashore we boarded the coach for the ride back to Te Anau where we were dropped off at the B&B. One last story before we leave Te Anau, we went to an Italian restaurant on Saturday night, it was quite busy and we only stayed long enough to eat a bowl of pasta and share a desert. The next morning our hostess Philippa asked if we had enjoyed our meal at La Dolce Vita – how did she know where we had been? Apparently, we had been spotted by some of her relatives who had been eating there too, they reported back that they had seen two ‘seniors’ at the restaurant and thought we must be the couple staying at Dunluce!! A little harsh I think! And there was I thinking how relaxed and youthful you both looked in the photo! ! Yes that says it all! Seniors eh – that’ll teach you to be 1/2 a day ahead of us!! 13 hours actually, nice email as well!